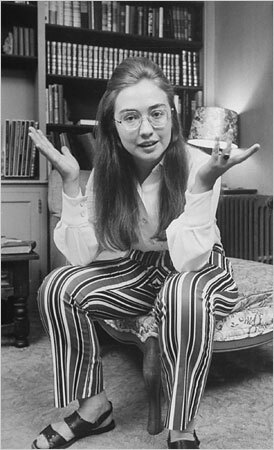 The picture from this event reminds me of this photo of Hillary at Wellesley. She was wearing glasses and was in the same posture. The emphasis below is mine. You might have read about these comments today. MS. SAHA: Welcome and good morning. Please welcome our honorable guest here, Ms. Hillary Rodham Clinton. MS. SAHA: Welcome. (Applause.) I’d like to start our show. We call it our Conversation with Bangladesh. Bangladesa sange Adda. And I’d like to now introduce my friend here, Ejaj. He’s a young leader. I call him leader of the leaders. (Laughter.) Well, shall we start? MR. AHMED: Sure. Madam Secretary, welcome to Bangladesh. We are so pleased to have you with us in Dhaka. First time you visited us 17 years ago in 1995 as the First Lady of the United States, second time, here as the Secretary of State. How do you feel to be in Bangladesh? 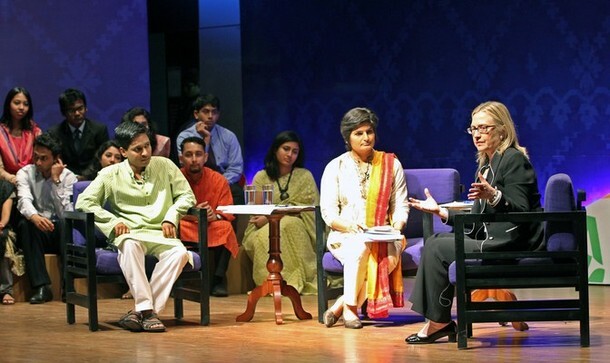 SECRETARY CLINTON: Well, first I want to thank you, Ejaj, and you, Mooni, and all of you for being here at the International School for this conversation, because I am very interested in Bangladesh and everything that you’re doing, and I’m particularly interested in the young people of this country. So I’ve met some of the young leaders who are here, and I see others out in the audience, and I’m looking forward to hearing from you. I want this to be a real conversation, and I thank you both for moderating it. I was here 17 years ago and had just the most wonderful experience with my daughter meeting so many Bangladeshis at that time not only here in Dhaka, but going out into the country, going to villages, visiting Grameen Bank, Bowers, people working BRAC projects, really getting a sense of the potential of the country. And coming back 17 years later, it just confirms my confidence that there is a tremendously positive path for this country. And it’s not easy; you know that better than I do. But the changes, the economic growth, the continuation of democratic sustainment – all of that is very encouraging. So I’d love to hear more about what you think is needed for this country to realize its potential. As I said last night in my press conference, I’m betting on Bangladesh. I’m betting that you’ll be able to work through all the problems that developing countries have everywhere. SECRETARY CLINTON: And the United States wants to be your partner, because what we care about is a successful – (applause) – prosperous, peaceful, democratic country. MS. SAHA: Well, Madam Secretary, you know the word adda? May I explain you? In Bengali, we call adda, is that Bengali expression like (inaudible) or chitchat. So before I go to the audience, I would like to ask you one question. We heard that you had a meeting with Sir Abed and Dr. Yunus, of course. MS. SAHA: And how was that? And I will say that I am committed to every way that I can and my government can to supporting their efforts, because we think they are so valuable. And I have followed the dispute over Grameen Bank from Washington, and I can only hope that nothing is done that in any way undermines the success of what Grameen Bank has accomplished on behalf of many millions of poor women and their families. And I know some of you – I met a young woman who is the daughter of a Grameen borrower, who’s now at university. That is how change happens. You help somebody get a better income that they then invest in their children and their family. Then the next generation goes further. That’s the story of America. I want it to be the story of Bangladesh. And the Grameen Bank has played an instrumental role. So I highly respect Muhammad Yunus, and I highly respect the work that he has done, and I am hoping to see it continue without being in any way undermined or affected by any government action. That would be unfortunate, because I come from – (applause) – I come from this perspective. If you look at societies that are successful, there are three stools – there are three legs to a stool, if you think about it. You have to have a responsible, accountable government that delivers services to its people; you need a private business sector that produces jobs and economic growth that is broadly spread, which is beginning to happen here in this country; and you need civil society, because neither government nor business can or should do everything for people. What you are doing as a youth leader and all of you who are involved is building that third leg of the stool here in Bangladesh. That’s where so much of what makes life important and – (applause) – meaningful happens. So I had an excellent meeting with both of those gentlemen this morning and just have the highest regard. And every Bangladeshi should be so proud of what they’ve accomplished for your country. MS. SAHA: Madam Secretary, we know what happened with Dr. Yunus. All of us, we know, and we feel very sorry for that. But I’d like to know what does – U.S. Administration’s stand on the matter of Grameen Bank. SECRETARY CLINTON: We do not want to see any action taken that would in any way undermine or interfere with the operations of Grameen Bank or its unique organizational structure where the poor women themselves are the owners. That has never happened anywhere in the world. It is now being duplicated. Other countries are looking to see what worked here in Bangladesh. So other countries are saying, “What can we do to try to create something like that?” So I don’t want anything that would in any way undermine what has been this tremendous model that has stood the test of time over the last decades as a very important tool for lifting people out of poverty. MS. SAHA: Well, you have just visited China, and you will visit India in between – now, you are here in Bangladesh. So how do you consider us, like, Bangladesh, as an emerging soft power? SECRETARY CLINTON: I think you have extraordinary soft power. SECRETARY CLINTON: And let me just – (applause) – explain why. First of all, you are strategically located between east and west of Asia. You have the opportunity to be a crossroads, as you historically have been; the Grand Trunk Road, the old Silk Road, all came to Bangladesh. And now you have an opportunity to serve the same role in the 21st century. I think the success that you’ve seen in lifting people out of poverty over the last years, dropping the poverty rate, I was told, from 40 percent to about 31 percent – it has to keep being driven down, but that’s a very good sign. The fact that you’ve maintained democracy through a really difficult set of challenges is important; the fact that civil society is developing, as evidenced by all of you. The education system is being more responsive; you’re getting, I think, close to 100 percent primary school enrollment. I think that those are all very strong signals to yourselves as well as the rest of the world. You’re the largest contributor to United Nations peacekeeping operations. You have seen an increase in agricultural productivity. You’re now self-sufficient in rice. The United States is working with you on that. You’ve dropped child and maternal mortality so that it appears that you will meet the Millennium Development Goal for maternal and child mortality. I mean, you go through the list of what you have accomplished in the last 17 years since I was last here, and it’s been a remarkable commitment of the Bangladeshi people, and I think the people deserve most of the credit. In a democracy, the people have to be given the credit because the government, remember, as Abraham Lincoln said, is of, by, and for the people. And so the people have demonstrated great resilience and determination. But you’ve got some challenges, and you know you have some challenges. I mean, you still have too many unemployed and underemployed young people who are not seeing a good future for themselves. You are starting to see some worrisome labor problems in the garment industry, which have to be solved, because you don’t want to get a reputation as a place where labor leaders and activists are murdered or where people are taken advantage of or abused in poor working conditions, because in today’s world, that will cause big manufacturers of clothing to be afraid to stay or come to Bangladesh. So the government and the garment factory businesses and the labor organizations have to work together so that you stay a very important destination to bring and create more jobs and have more exports. We talked with your government about how we can facilitate all of that. There needs to be total rule of law, no impunity. The recent killing of the labor activist, Mr. Islam, has to be investigated, and the perpetrators, if they can be found, need to be brought to justice, because you have to constantly be demonstrating no one is above the law no matter how powerful or positioned in society. So you have continuing challenges, but I think the glass is more than half full. It’s just a question of how you tackle some of these issues that are really found in every developing country. They’re not in any way unique to your country. But the world is beginning to expect more from you, because you have shown you can produce. You can get things done, you can make progress, and I think that’s a good problem to have. SECRETARY CLINTON: And of course, we really believe that it is rooted in this new energy that we’re seeing coming out of your country to really make a difference and to show the world that your soft power is to be reckoned with. MS. SAHA: Thank you, thank you, thank you. MR. AHMED: Talking about energy, I also want to give you a sense of who is in the audience. We have civil society leaders. We also have students from different universities, educational systems, and behind me you will see the eight-member youth advisory council of the ambassador, and this is a think tank the ambassador has put together to consult on issues relating to youth. And we also have representatives from many youth organizations such as the (inaudible) for Bangladesh, (inaudible) Initiative and Community Action. I also want to give an opportunity to young people to raise their voice and share their concerns with you. So perhaps we could start with Momita, a student at the Asian University for Women. QUESTION: Honorable Secretary of State, this question actually came from Tushar Bhutto from the Facebook page of U.S. Embassy. And the question is: What is the main obstacle for building peace in this region? SECRETARY CLINTON: Well, I think that there have been longstanding historical conflicts in this region. I mean, your country was born out of a conflict, as you know. There has been problems with and among your neighbors, both your immediate near neighbors and your further neighbors. And we know that some of those feelings and grievances still are present. But what I’ve been encouraged by is the outreach I see going on in this region between countries, because if you look at the region as a whole, if you take from Bangladesh through India, Pakistan, Afghanistan, up into Central Asia, this region has been held back in development because of the closed borders, because of the historical enmities that have dominated the minds of people in the various nations. And the result is that you don’t trade with each other, you don’t exchange with each other to the extent that most other regions of the world do, even with former enemies. You think about Europe, where a – two terrible world wars were fought in the last century, and now they’re part of the European Union. And they are rich and they are – they may have economic problems, but given the high level of their standard of living, they will be dealing with those over time. But what’s fundamentally important is that they put aside centuries of warfare and terrible violence between them in order to learn how to cooperate. You look at ASEAN, the Association of Southeast Asian Nations, that is working toward developing greater trade ties, or you can see it happening in Africa, you see it happening in Latin America. And it’s very important that this region of South Asia be part of that. So yes, it is a problem. There are lots of difficulties and mistrust that exists. There are all kinds of political and ideological differences, but it’s important to keep making progress, to find specific ways to work together. We’re beginning to see increasing business between Pakistan and India, for example. They’re starting to open up as to trade and business visas. Now, that doesn’t mean they’ve solved their problems. That doesn’t mean that they have decided they’re going to trust each other, but it means that they’re being practical and realistic. MS. SAHA: Well, Madam Secretary, I have a question. Whenever we talk about our internal politics, we seek U.S. advice. Why is that? SECRETARY CLINTON: Well, I think that for people who believe in democracy, the United States is now the longest-lasting democracy in the world, and we’re very proud of that. But there’s also a recognition that we didn’t get there overnight, that we didn’t just wake up in 1789 and say everything is solved. We had a lot of problems. I mean, we had slavery still. We didn’t empower women until the 20th century. We had to fight a civil war to end slavery, and we had to keep working on our civil rights movement to recognize the human dignity of every person. We had to work on religious tolerance. The United States is a very religious country, but it’s also a very pluralistic country. You can go and see churches, mosques, synagogues, Hindu temples, you name it, where people are free to worship as they choose, and that all took time, and it took a lot of work by succeeding generations of Americans. And it wasn’t just our government and political leaders. It was the – what we call habits of the mind of our American citizens that Alexis de Tocqueville talked about when he came to the United States in the 1820s, and he said this is a new kind of people, where they think for themselves and where they work with each other and where they’re overcoming these divisions that had kept them apart if they had lived back in the place where they came from. And many of you have studied in the United States. How many have you have studied in the United States? We’ve got a couple of hands here. We want more of you to study in the United States. (Applause.) We want you to come on student exchanges. And we are doing a big push through our Embassy to create more study opportunities for young people from Bangladesh. SECRETARY CLINTON: — advice. It’s ultimately up to any country whether to take it or not. But I want to stress something I said in my press conference. The United States is investing significant sums of money in Bangladesh. And one of the reporters said, well, why are you doing that? We’re investing in helping in helping you improve agricultural production through our Feed the Future program. We’re investing in helping you build health systems through our Global Health Initiative. We’re investing in technology and other approaches to mitigating climate change. We’re working with various groups within Bangladesh on economic projects and other things. So why do we do that? Well, we do believe that spreading democracy is good for the world. We believe that. Now sometimes the decisions democracies make are not ones that you or I would make, but we think, over the long run, having people empowered, given their rights, is the best form of government that has been invented. It certainly beats all the others. And so we think a strong democracy here that is able to realize the aspirations of your people is not only good for you, but it’s good for the kind of world we would like to see. And that’s our hope. MS. SAHA: Thank you. Thank you. Can you take questions from the floor? MR. AHMED: Sure. I will – I have two of my friends, Savir and Jonathan. If you raise your hands, then we will take your questions. PARTICIPANT: We have so many hands up in the air. PARTICIPANT: And it’s hard to pick one – so many eager young faces. I would go with you, please. Please tell your name. SECRETARY CLINTON: Well, thank you. And congratulations on your graduation. I also graduated from a women’s college – (laughter) – in the United States, called Wellesley. And so Mount Holyoke and Wellesley are what we call seven sisters; we’re two of the sisters. You’re right. Climate change is one of the biggest threats to low-lying countries like yours, to island nations across the oceans. So we are particularly focused on seeing what we can do to help, and here are a couple of things. I also announced yesterday a grant to work between our research institutions and yours, $17 million over the next few years, to think of ways that we can help mitigate the effects of climate change here in Bangladesh – how we use technology, what kind of agricultural practices, what kinds of other responses to rising waters, or the effects of increasing and intense – intensity of storms, and all of the issues that we are studying together. We are looking to figure out ways to actually put into practice the fund that has been agreed to with the large economies, making contributions to try to help countries that are at risk. But among the challenges we face is to make sure we all know what works best, because as we try to reduce emissions, we still have to deal with the dangers that you are facing at the same time. So we – that’s why this grant to work with you is so important. The other thing I have just started – and Bangladesh was a charter original member – is something called the Climate and Clean Air Coalition to prevent short-lived polluters – pollution like methane or black carbon or soot. And we are working with a small but growing group of countries – Bangladesh, Sweden, Canada, Mexico, the United States, and others – to take action on these pollutants while we still work on carbon dioxide, because they’re about 30- to 40 percent of the problem with greenhouse gas emissions. And there are ways of attacking those right now. For example, Bangladesh has joined something that we are sponsoring called the Global Alliance for Clean Cookstoves, because the way that women in the developing world cook the food for their families kills 2 million women and children a year because of respiratory distress and diseases, and pollutes the atmosphere. So we are working to try to develop clean cookstoves that will then be made available through organizations like Grameen Bank or BRAC so that we can help cut the pollution and improve the health. MS. SAHA: We learned that you’ve become the champion for using social media. So how do you manage? (Laughter.) You have a Face. SECRETARY CLINTON: I have to say that I think social media is used much, much more by young people than people my age. I’m well aware of that. But we in the State Department have tried to empower our diplomats to use social media, particularly to reach out to young people around the world. And in fact, I was over at the Embassy thanking our employees who work at our Embassy in Dhaka, and thank them because the Facebook page for the Embassy in Dhaka is the third-most used in the world – (applause) – for all of our State Department. MS. SAHA: Now Madam Secretary, you have bunch of questions through social media, through Facebook and our ATN News email. So I’d like to – (inaudible), you wanted to ask something on behalf of ATN News. QUESTION: Thank you (inaudible). This question came from a public poll conducted by ATN News. The question is from Piel Alem from (inaudible). What you say about the common perception held by many young people that the U.S. is anti-Muslim? SECRETARY CLINTON: Oh, that hurts me. (Laughter.) That hurts me so much, honestly. I mean, it’s a painful perception to hear about, and I deeply regret that anyone believes that or propagates it. So let me say first that certainly I think the way the United States demonstrates respect for religions of all kinds, and particularly gives people from every religious faith the opportunity to participate in our society, is an important statement of our beliefs and our values. And are there – is there discrimination or prejudice in the United States, like in every society and country in the world? Unfortunately, yes. I mean, human nature has not changed dramatically. There is discrimination against people of different religions, of different races, of different ethnic groups all over the world. We see the results of that. But I don’t think that it is at all fair to hold up the United States, separate and apart from the challenges that we all are confronting to make sure that we respect the rights of every human being. And I believe that the United States, through our laws and through our constant political dialogue, has gone probably farther than anywhere else in the world in trying to guarantee legal protections for people. I would like to see more countries do more to protect the rights of minorities because I think that’s an important part of democracy and of recognizing that no matter what our religion or whatever our background might be, we share this planet with people from many different vantage points, and we should be respectful. So I think that part of it is the fact that we have been engaged in self defense and in protecting ourselves for more than 10 years. And we have gone after the terrorists who, personally, I do not believe is in any way reflective of Islam. I think that people who use religion, who pervert religion, for their own power or their own personal needs or their own desires are doing a great disservice to religion. And you find people who, over history, have used every religion for that purpose. And it’s unfortunate that terrorists today, at this point in history, are too often using a religion that is one of the great reflections of man’s faith and one of the three monotheistic religions that I came out of, as a Christian. So we know that there are those who, for their own reasons, try to politicize what the United States has done in a way that I think is unfortunate and unfair. And I certainly think President Obama has sent a very clear message of respect and appreciation of all religions, and in particular of Islam. So it is something we’re aware of and something we will continue to speak out against, but I think, looking at how the United States practices religions tolerance is something that speaks louder than any person’s political statement would. PARTICIPANT: (Inaudible.) Can I please jump in? PARTICIPANT: I’m sure that we have many eager audience – in fact, I have a question, but – (laughter) – I’ll leave it to audience. So, let’s see. We have this young fellow here. So, sir, what’s your name? QUESTION: I’m (inaudible) from University of Dhaka. I have (inaudible) and now I am involved in (inaudible) University of Dhaka, and I am also (inaudible) at the American (inaudible) Association. In fact, I am (inaudible) common people because the students have the opportunity to go to USA, but you provided earlier a visa lottery that was open for common people. And with this lottery program, our people – almost 5,000 people very year went to USA, they contributed to your country, and they also contributed to the country because the (inaudible). But this opportunity is now closed for Bangladesh, so it is (inaudible) for us. So do you have any plan for resuming the DV program for our people or any other (inaudible) exchange program so that the common people can go to the U.S. and contribute to USA and (inaudible)? SECRETARY CLINTON: Let me ask one of our people here at the Embassy because – maybe let the ambassador directly respond to that. AMBASSADOR MOZENA: Thank you very much for that question. I know – (applause) – it’s one that might be on the mind of many of you. The Diversity Visa Program was formulated to assist those countries whose emigration flows to America were not at a high enough level, given the population of that country. And now so many Bangladeshis have, in fact, emigrated to America that Bangladesh has surpassed that level and therefore no longer qualifies for having the Diversity Visa Program. So that has now ended, as the questioner rightly pointed out. SECRETARY CLINTON: So why don’t you, Ambassador, talk about the efforts we are making to increase student exchanges and other study opportunities? AMBASSADOR MOZENA: Well, Madam Secretary, you may regret having asked me to do that. (Laughter.) It’s very hard to give up this microphone with that question in the air. On the stage is my youth council. We are focused on youth, on the leaders of today and the leaders or tomorrow. And we have a wide range of programs that – to facilitate youth going to America, to facilitate youth here in Bangladesh, working among themselves to help build this wonderful nation. The place to find out more about all of that is to come to our American Center here in Dhaka, also the American Corners in Jessore and Sylhet and Chittagong. And soon, in mid-July, we’ll be opening the Edward M. Kennedy Center in the Dhanmondi area among – close to Dhaka University and all of those private universities, reaching out to you, to the young people, to create a platform for you to build, work together to make the Golden Bangladesh. MR. AHMED: Madam Secretary, we’re going to take one more questions, definitely from this side. So. MR. AHMED: Okay. Sure. Please. QUESTION: Thank you. Well, first of all, I’d like to say you have got a very beautiful smile. (Laughter.) Anyway, I’m (inaudible). I’m a (inaudible). I’m also working as a lecturer in (inaudible) University of Bangladesh, and I’m also vice president of Bangladesh Youth Empowerment Society. SECRETARY CLINTON: Thank you. Well, I think that it is exciting to see the opportunities for women opening up in many places around the world, not just in my country, and here in your country. As I see more and more women taking positions of responsibility, not only in politics and government but in academia, in the professions, in civil society and business, that’s been one of the changes that I think has helped Bangladesh, to go back to Mooni’s question about soft power. The empowerment of women, half the population, makes a huge difference. And certainly, I have lived through that kind of experience in my own country, where more and more women were able to pursue their own dreams, to study in colleges and universities that were opening doors to them, to pursue careers, professions, and make a contribution. In my own case, I have always believed that you have to get a good education, which all of you are doing, to equip you to make the best decisions for yourself. You cannot expect to be able to advance in your own chosen path if you are not prepared. So the first advantage I had is I had an excellent education. I had a very good secondary education, higher education, went to law school, got a law degree from Yale University. So I felt that I had gotten the education that I needed to be able to start making decisions. I think second – the second advantage, which really has stayed with me my entire life, is that I had a family and I had parents, both a mother and a father, who encouraged me and who made no difference in their encouragement and expectations for me, their daughter, as they did for their sons. And I just lost my mother in November, but she was somebody who understood that you have to make your own way in life because ultimately that is how you will determine the purpose and meaning of your life. And she was a wonderful mother and gave me so much, and that, of course, made a huge difference. I think the other advantage is that I was determined, I was healthy, I had a lot of stamina, I had a thick skin – (laughter) – and therefore, as I went through various phases of my life and had people tell me from a relatively young age that girls didn’t do that or girls shouldn’t do that or you can’t have that scholarship because that’s only for men or you can’t go to that program, I just kept going. And luckily, a lot of those obstacles have been eliminated in my country. So the kinds of legal obstacles, institutional obstacles, that used to exist no longer do, for the great part. And so young women have more choices than even I had when I was younger. So I mostly see advantages, but that doesn’t mean that there aren’t problems and that there aren’t challenges and that there doesn’t remain a double standard, because – I will be – just – I don’t want to mislead you; there is a double standard. There’s a double standard in every society, including advanced societies that I live in or that exist in Europe and elsewhere. But you can’t give in to that. You can’t be embittered or angered by it. You just have to keep working to overcome it. And the final thing I would say is I was advantaged because I always believed that women had every right to go as far as their hard work and their talent would take them, but they would have to prove themselves, that there was no given, there was no presumption that couldn’t be rebutted. You had to demonstrate that you were capable and ready and willing to do whatever the job was. MS. SAHA: Madam Secretary, you are an inspiration and leader to us, and you are a loving mother, and you are a great soul, I must say. And my question is: You use your (inaudible). What is the magic? SECRETARY CLINTON: Well, thank you for that, because some days it feels harder than other days – (laughter) – to try to bring people together. I mean, I see a very important need in the world to overcome our differences and bring people together because we have so much to gain by working together. And I spend a lot of my time trying to convince people to figure out ways to work together. I mean, it was in the newspapers what I said last night. In both my meetings with Sheik Hasina and Begum Zia, I said I wish you could figure out ways to work together. You need to work together to get an election mechanism in place so that your democracy has predictability and can keep moving forward. In every place I go representing my country, I try to think of what is the best argument to make, what is the best way to present the potential of greater positive results for people if we can just figure out how to overcome and bridge our differences, because in the modern world in which we’re living, we’re all interdependent, we’re all interconnected. You just can’t say that you’re going to only deal with your own kind of person or you’re only going to meet your own kind of person or you’re only going to listen to your own kind of person. That’s not the way the world is going to work. And we’ll either figure out how to be more integrated or we will disintegrate. And we will have more conflict and we will have more problems that we won’t figure out ways to solve because we won’t work together. You have big problems with water, right? You’ve got to figure out ways to work with India and Nepal and other neighbors, and you have to make the case that it’s in their interest to work with you. So you don’t make agreements with people you agree with before you start. You have to figure out what are the areas of agreement that you can possibly meet together on. So I spend most of my time trying to think of smart ways to help people overcome what is keeping them apart, keeping their people poor, keeping conflict going, giving room for violence, and all of the problems that we have when I think the world has such an enormously positive potential for all of you. Because finally, I would say, Mooni, that the work I do is about my daughter and about the next generation and about the kind of future you deserve to have. And I said last night it’s like when Ted Kennedy came here as a young man and planted that banyan tree. That was an act of symbolic faith in your future. And the tree has flourished. Well, that’s like a metaphor. You have to be planting trees in soil that has been uprooted, sometimes polluted by all of the problems, but you have to keep doing it. And each of you who is a young leader has so much at stake in making your country what it can be in your lifetime. SECRETARY CLINTON: Well, I mostly deal with the experienced leaders, the leaders who’ve been around for a long time, because those are the people I sit across the table from – presidents, prime ministers, foreign ministers, other national leaders. But most of them are beginning to see that the world around them is changing. You cannot escape social media. Social media can get information to people that governments used to try to control and prevent you from having. Politics is utterly changed because it’s not just authorized sources of information that the government approves about what is happening politically. It’s bloggers, it’s tweeters, it’s people with an opinion. And everybody who has a cell phone can take a picture of a corrupt official demanding a bribe, and post it, and say this should be a corruption-free country, and we’re going to do everything we can to stop it. And they can also call out leaders who are abusing power and abusing human rights. So even experienced leaders now have to recognize that you can’t keep doing politics the same old way. And there has to be an openness to new ideas, an acceptance of accountability. I mean, one of the biggest problems in developing countries – and look, it’s a problem here – one of the reasons that you’ve not been eligible for a Millennium Challenge compact is because of corruption and the failure to take more steps to stamp it out. So every leader has to be asked, “Are you in this – are you in politics and government for yourself, or are you in politics and government for the people of your country to leave them a better a future?” That’s the question. So now it can be asked not just by journalists but by millions of people who are connected on social media. And I think that’s a promising development. A lot of governments are trying to figure out how to prevent that. We do a lot of work in the State Department to break down the firewalls that authoritarian governments try to put in place to prevent their own people from getting information. We’re seeing it now in Syria, a brutal, violent crackdown on what started as peaceful protests by students and young people, which is now morphing into a very widespread conflict that is very dangerous. Inside Iran, constant efforts by the Iranian Government to keep information out so that people don’t have a chance to think for themselves. And so we do what we do, spend a lot of time trying to help those people inside such countries have access to information that they can then convey. And I think every leader is going to have to deal with that. MR. AHMED: Can we take a few more questions from the audience, please? MR. AHMED: Yes. And we can also take questions in Bangla. (In Bangla.) Okay. Let’s go to our friend over there. QUESTION: Well, thank you. This is Razound ah-Mazoud, a student of international relations from University of Dhaka. Well, we have seen that there was a signing of a partnership agreement last night between United States of America and Bangladesh. And now much hopeful can we be of seeing a long-term strategic and stable U.S.-Bangla relations for a future generation? And what role do you expect of the Bangladesh to play in the region where we have Pakistan, Afghanistan, China, and India not far from us, in fact and (inaudible) issues? Thank you. SECRETARY CLINTON: Well, the question is a very good one because part of the reason that I wanted to develop and then sign the partnership agreement last night is to do exactly as your question implied, to put our relationship on a stable basis, regardless of who our president is, who our secretary of state is, who your prime minister is, who your foreign minister is. It should not be dependent upon the personal – the persons holding the positions; it should be between our two nations, between our governments and our people year after year after year so that we develop institutional cooperation between us. And that’s the purpose of that partnership agreement, and I’m very pleased about it because we do a lot of government-to-government talking, we do a lot of government-to-NGO talking, we do a lot of government-to-business talking. But I wanted to bring it all together under one umbrella so that we could count on it lasting year after year after year, because that’s the kind of partnership we want to have. MS. SAHA: Yes. No tariff. Yeah. SECRETARY CLINTON: — kind of cooperative agreements that I think are very good, not only for Bangladesh but for the region. So I would urge that. SECRETARY CLINTON: Well, we’re certainly looking to see what we can do. I heard quite a bit about that last night, and we want to finish a trade and investment agreement. But I’ll give you an example of the kind of agreements that we want to enter into on trade and investment, because we’re very close, we hope, to negotiating this – do have requirements for labor standards, because we think if you’re going to become a middle-income country, you have to have a strong base on which to build that kind of labor force, and so you want to build in labor protections. And that, to us, is a key part, and it’s also part of the International Labor Organization Declaration. Because after a certain point of development – and you’re seeing it in China. China’s having more worker unrest, more labor problems. They’re finding all kinds of outside attention as to how they put together electronics or garments or whatever. So as you evolve economically, you have to begin to have a legal framework to protect labor rights. So in our agreements, we do have requirements, and sometimes those are difficult, not only for the government but for the business sector. But we think it’s the best way to set out how you’re going to have the kind of economic progress that will not just exploit people but will build a better future. MR. AHMED: Absolutely. Thank you. Samir, do we — (applause). MS. SAHA: Lots of questions. PARTICIPANT: It’s very hard to pick one, seriously. PARTICIPANT: Like her. I hear you. This side, this side. (Laughter.) Please. QUESTION: (Via interpreter.) My name is Alia Atta. I am the general secretary for BGIF. We work with workers’ rights. And there we face all kinds of obstructions with the police, goons, thugs, and false allegations in court. And, in fact, one of our leaders, Aminul Islam, was very brutally murdered. With such conditions, how can we work with the cause of workers’ rights? Thanks. SECRETARY CLINTON: Thank you. (Applause.) And – well, first let me say that I spoke out strongly to point that there needed to be an independent investigation into the murder of Mr. Islam, because certainly his family and his colleagues deserve answers about what happened to him. So on that particular case, this is a real test for the government and for the society to make sure you don’t say that anyone can have impunity. That’s a key issue for the rule of law. Secondly, on your larger question, the history of labor rights and labor unions in any developing society is always difficult. There are strong forces that oppose workers being organized. We have this in my own country. You go back to the 19th and the early 20th century when labor unions were just getting started, there were goons, there were thugs, there were killings, there were riots, there were terrible conditions. We passed laws at the beginning of the 20th century against child labor, against too many hours for people to work, but that took time. It took time to develop a sense of political will to address those issues. So you are beginning that, and it’s a very important struggle. I think in today’s world, everything is accelerated because everything is known. There are no secret issues that can’t be exposed. There are exposes about factories from China to Latin America. So you are doing very important work. Do not be discouraged or intimidated. But you deserve to have the support of your government and your society. The third point I would make is that we have worked from Colombia to Cambodia with the owners of factories and other enterprises to help them understand how they can continue to make a very good profit while treating their workers right. And in fact, we have spent a lot of time trying to help owners of businesses understand how to do that. And it’s worked. And we have people who are quite experts in that. For many years, Colombia, the country in South America that has one of the fastest-growing economies in the world right now, had hundreds of labor organizers killed. And they were killed by economic forces and political forces that didn’t want to share power, didn’t want to share profits, who didn’t see that that was part of the obligation of democracy and society. So we have seen this happen all over the world, and we stand ready to work with factory owners and labor organizers to have a better dialogue, to understand what can work, and then to help you implement it. SECRETARY CLINTON: Well, first, I want to recognize that the way that you handled your maritime boundary with Burma and the way you’re handling it with India is exactly the way it should be resolved. You went to the international authorities, you submitted your information, you’ve had a favorable ruling. But you did it by a peaceful rule of law approach, so I really compliment you on doing that. And – (applause). MS. SAHA: That’s smart power, they use. Must be. It must be use for smart power. SECRETARY CLINTON: It’s very smart, because it’s now resolved. And it comes at a very good time because, as Burma is reforming economically and politically, I think that Bangladesh can be a big help to the people there. And there’s also economic opportunities for your businesses in working across the border. So I think it’s a win-win for your country. And I would hope that as the democratic reform effort there continues, civil society here will also get involved because they’ve been under a military regime for 40 years, right? So they don’t have yet the institutional experiences that you have been developing. So I hope that there’ll be some outreach to try to assist them as they make progress. MS. SAHA: I specifically like to know about the investment in energy and power sector. SECRETARY CLINTON: Well, energy and power is critical, we know, to Bangladesh because you still don’t have reliable, affordable electricity across the country. And we talked last night, and as part of the partnership agreement, the government asked if we would provide technical advice about potential development of your hydropower, exploring whether you have natural gas, unconventional gas resources, including shale gas, other kinds of advice that we would be willing to offer. So we’re going to send a technical team to work with you on that, what kind of renewable energy in addition to hydropower, whether there’s an opportunity for geothermal, for wind, for solar, greater than has been anticipated. So we stand ready to help you meet your energy needs. MS. SAHA: — from – exactly what you are taking back. SECRETARY CLINTON: Well, I’m, first of all, taking back just the overall impression of the dynamism and the progress that is being made here and in the region. You’re right; I was in China. China obviously is continuing to grow and develop. They would be the first to tell you they still have hundreds of millions of people that they need to lift out of poverty, that they need to educate, that they need to provide health care for. So they are the most developed developing country, that is for sure, but they still are facing issues they have to address. I’ll be going on to India. India, too, is making progress, has hundreds of millions of people still in poverty that they have to find ways of providing income to, education, health care. So I think that the region itself, with you right strategically situated between China and India, has developed incredibly fast, but people’s aspirations probably have developed faster. So there’s now a greater expectation that people’s economic and political needs will be met. And I personally believe that you are on the right track. Over the long run, people’s freedoms cannot be denied. And what you’ve done by taking a democratic route – it may be messy, because democracy is messy; it may not have top-down control over everything, but that way you also don’t prevent good ideas from bubbling up – you are on the right path. But you know the problems you face. You understand that far better than I do. And what you need is national unity and a consensus toward continuing that progress. And I know that’s hard. You have two very powerful political parties that alternate between one and the other, and you have a lot of challenges to the sustainment of a peaceful political path forward, but the people have to demand that. Regardless of who you vote for or what party you support, the people have to demand that everybody is trying to accomplish the same thing, which is continuing the economic development of the country, providing democratic institutionalization for the country, respecting the human rights and human dignity of every person in the country, bringing people together, developing a volunteer mentality so that people go out and help each other, because the government cannot and should not be expected to deliver everything everybody needs. That is a recipe for failure in today’s world. So you are on the right track. Build up civil society and continue to support democracy and economic opportunity and market development. And I feel very positive about what I’ve seen and heard, and I’m particularly impressed by the young people who I have met. PARTICIPANT: Thank you, Madam Secretary. Thank you. I would like to request (inaudible) to thank Madam Secretary on behalf of the audience, and please (inaudible). SECRETARY CLINTON: Oh, my God – (applause). Thank you. MS. SAHA: Bangladesh is (inaudible). SECRETARY CLINTON: Same to you, my friend. Thank you so much. Good luck to you. Thank you. SECRETARY CLINTON: Thank you. Thank you all. Another endorsement, of a sort? And she didn’t give a million now for an answer this time. Maybe she was being polite or maybe she still can’t think of really retiring just yet. Who knows? * a million nos. Sorry! From Mr. Ahmed’s lips to the Lord’s ears!!! They know what a leader looks like. It’s something that transcends culture. People see this in Hillary no matter where she goes. I like that pic of Hillary. As a matter of fact, I have the LIFE magazine issue where that pic is printed. Well, she better get some rest the next 3 years because we won’t take “no” for an answer. LOL!!! Argh…… I can’t think of a better comment right now. If all of her “nos,” according to some pundits, are not totally convincing…………. I just don’t know what to say in response to her own words. In 2006, Hillary said she wasn’t running for President in 2008. Then after the 08 election, she said she planned to stay in the Senate and wasn’t interested in a Cabinet position. Hillary’s record on saying “no” speaks for itself. It would be nice to be able to take a politician at there word just once in my lifetime. There’s a time and a place for a politician to make major announcements, and now is not the right time for Hillary to announce anything about her plans for 2016. Look at all of Romney’s potential veep candidates– wherever they go, someone asks them if they’ll accept if Mittens offers them the veep slot. They either dance around the question or else they say they’re perfectly happy with their current job and have no plans to leave it. But we all know they’ll say yes if Romney wants them on the ticket. It’s like a game they all play with the media. The popularity of this practice does nothing to make it any less tedious. As a member (perhaps the most effective) of the administration who is doing her breakneck best to get as much work in under the wire before she leaves, and as the ONE who is supposed to remain apolitical, what exactly do you expect her to say? I expect her to say nothing different. This kind of charade is, of course, protocol. Everyone does it when they have to and whenever they want to as well. It doesn’t change the fact that I don’t like political bullfunky to be so obviously untrue. Just a thought, but there is the chance that when she said no in the past she meant it and that she means it now. I have said no to important things in the past and then changed my mind. Being able to change one’s mind indicates a kind of flexibility I find attractive in a candidate. That’s what I liked about a recent interview her husband gave. It made her “no” sound like more than a thin veil barely shrouding her eventual run. The denial is not what I have a problem with, it’s the fact that everyone takes it as a lie.